This remarkable tapestry "European Summer Quince" shows a beautiful tapestry based on the original work of William Morris. The summer quince fruit tree is seen here in full fruit, and rises tall among an upwardly swirling acanthus leaf design. The tree is also surrounded by beautiful flowers and blooms ranging from yellow browns to red blues. The sophisticated blue greens complement the olives in this work perfectly. 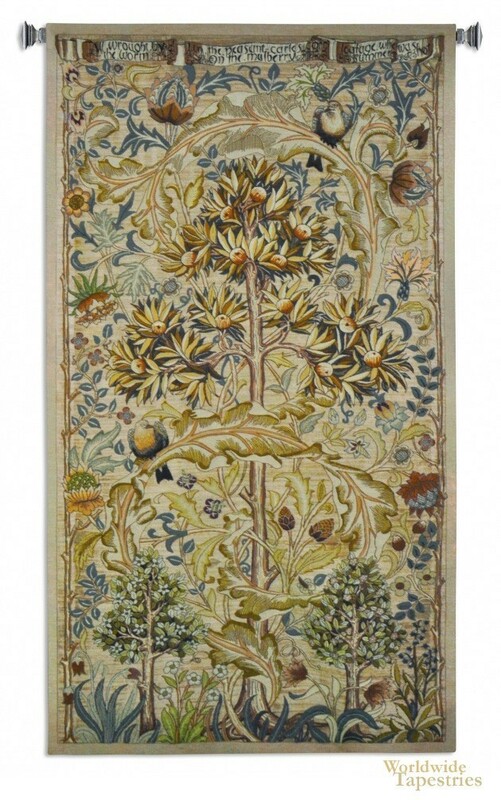 The sense of movement and activity in this masterpiece is evident, and is a hallmark of the designs of William Morris. This tapestry "European Summer Quince" is backed with lining and a tunnel for ease of hanging. Note: Tapestry rods and tassels, where pictured, are not included in the price. Dimensions: W 34" x H 64"